This sweet little bag is in daisies and flamingoes cotton prints and it has a small teddy wrapped up in a crochet blanket inside. The little bags are very popular with children (and adults too! ), because they not only work as a carry bag for the sleeping teddy (or another soft toy if the child prefers), but because they come in lots of pretty cotton prints in all colours, so there are many to choose from. And what makes them extra special, is that each bag has a small, 5 inch teddy inside, wrapped up in its own crochet blanket. Like all handmade items, the bags do vary a little in size. This one measures 6 inches (15 cms) in length by 9 inches (23 cms) in width at the base. Shoulder strap is 19 inches (48 cms) long. This little bag in daisies and flamingo print is in the Elephant Sun Dog Etsy Shop as I type this. I will post more there for those who cannot make it to our Christmas Fairs. The bags are all in different colour cottons. No little bag is exactly the same. 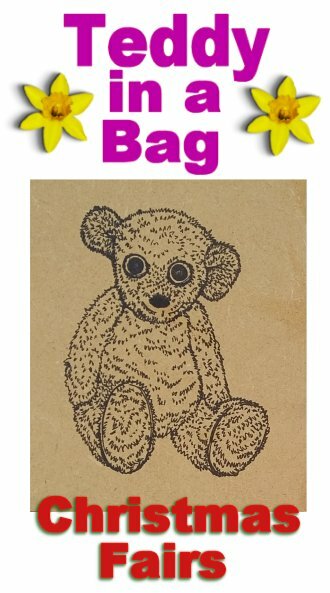 On Etsy, the little bags with teddy inside retail at £9.00 each. This price includes packaging, postage and processing. I also sell these dear little bags and teddies at Markets and Fairs, where, for now, the price will remain at £6.00 per bag with teddy. These bags are an ideal bag for a child who would like to use it as a carry case for the teddy, or other soft toys or dolls. I will post some more of these little cotton bags soon, to show you the many variations we have in stock. Posted on November 11, 2018 November 7, 2018 by Silvi VealePosted in Cotton Bags, Little Bags, Shoulder Bags, Teddy in a bagTagged all ages, Children's bags, cotton, Shoulder Bags, small bags, small teddy, Teddy Bags. This is the second little bag with teddy inside that I have just posted to my Ebay sales page and this one is in a patchwork of roses and little flowers and in lovely shades of blue and pink. And of course I mustn’t forget the small, 5 inch teddy wrapped snuggly inside in his baby rainbow colours crochet blanket. Just like the previous little bag , this one is made in three different cotton fabrics, with patchwork blue and roses print, a matching pink roses print, and the reversible lining also has pretty flowers, with the shoulder strap repeating the patchwork pattern. The bag is approximately 6 inches (15 cms) in length by 9 inches (23 cms) in width at the base. Shoulder strap is 21 inches (53 cms) long. As with the other teddy, this one is jointed and made in plush fabric and is approximately 5 inches (12.5 cms) in height. It carries the CE mark. The little snuggle blanket wrapped around the teddy is crocheted with baby acrylic yarn. This is another little bag (and teddy of course 🙂 ) which will make a lovely gift for a child and would make a lovely Christmas present. The price is £9.00 with no extra charge for postage and packing. Posted on November 8, 2018 November 8, 2018 by Silvi VealePosted in Cotton Bags, Little Bags, Teddy in a bagTagged all ages, Children's bags, childs tote, cotton, Ebay, floral print, Shoulder Bags, small bags, small teddy, Teddy Bags. Childs Lilac Patchwork Reversible Cotton Bag With Small Teddy In a Crochet Blanket. This dear little cotton bag is fully reversible and comes with a small teddy snuggled up inside, wrapped in its own soft crochet blanket. The bag is made in three different cotton fabrics, with lilac flowers and lilac print making the outside of the bag, while white on lilac polka dot print is on the inside and the shoulder strap repeats the patchwork design. As the bag is reversible, the polka dot side can be easily used as the main side of the bag, if preferred. Teddy is jointed and made in plush fabric and is approximately 5 inches (12.5 cms) in height. It carries the CE mark. The little snuggle blanket wrapped around the teddy is crocheted with lilac mix acrylic yarn. This little bag is available on Ebay at the price of £9.00 with free delivery to the UK. I think it will make a lovely gift for a child and would make a lovely surprise present.